The heavy spell of rain under the influence of a Well Marked Low Pressure over the Bay of Bengal which is continuing since last night has thrown normal life out of gear in the city. 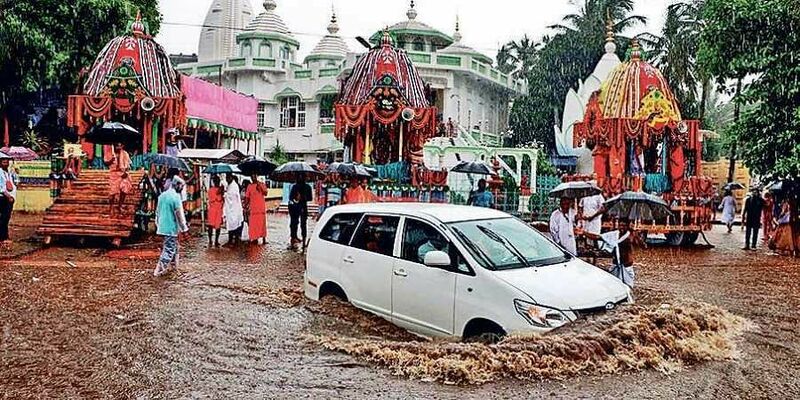 BHUBANESWAR: Incessant rain coupled with water-logging on Monday triggered a flood-like situation in almost all parts of the capital brining normal life and traffic to a grinding halt. The heavy spell of rain under the influence of a Well Marked Low Pressure (WMLP) over the Bay of Bengal which is continuing since last night has thrown normal life out of gear in the city. Several areas and major roads remained water-logged for hours while flash flood conditions caused a number of vehicles to be struck in water. The torrential rain caused traffic lights to stop working at certain inter-sections, while many vehicles, especially buses and cars were stuck leading to traffic jam on a few major roads. Commuters were also inconvenienced as trees were uprooted at various roads including at Behera Sahi in Nayapalli and AMRI hospital road. Heavy showers also exposed the inoperative drainage network of the Smart-city with many low-laying areas being inundated with rain water. In spite of Bhubaneswar Municipality Corporation (BMC) and (National Highway Authority of India)'s joint effort last week to clear culverts and drainage along NH 16 in Nayapalli, the service road in front of Iskon temple was water-logged again. The situation at Behera Sahi, opposite to Iskon temple, was no different due to heavy influx of rain water. Besides, several low-lying areas including GGP-Canal road, Laximisagar, Vani Vihar Acharya Vihar, Jayadev Vihar, Sailashree Vihar, Old Town, Kalpana Square, Chandrasekharpur and Patia were water-logged and submerged under rain water. Residents had to undergo a harrowing experience as rain water also entered thousands of unelevated houses in these low-lying areas and caused damage to properties. Over 200 houses at Amrapalli, Indrapuri and Saswatvihar in Sailashree Vihar area were flooded with rain and drain water, said AK Patnaik general secretary of Sailashree Vihar private plot residents welfare association. Patnaik said, "Ground floor of many houses were filled with water to a level of four feet which caused damage to electronic goods and furnitures." Besides, communication to the area was cut off as heavy and continuos downpour filled roads with a water level of two feet, he said. "For last five years we have been demanding before the BMC and H&UD department for development of drainage system in our area. However, no steps have been taken in this regard so far," Patnaik added. People of other low-lying areas also complained about poor drainage network of the city which is causing rain water to enter into the houses of the residents. While the city was facing a flood-like situation Mayor Ananta Narayan Jena and BMC vice-chairman Krishan Kumar remained inaccessible .